Radio Frequency over Glass (RFoG) is used to replace the coaxial part of the HFC network with single fiber transport. The application of RFoG was first defined by the Society of Cable Telecommunications Engineers (SCTE). According to the ANSI/SCTE 174 2010 Standard, the RFoG system starts where the plant becomes passive and is further extended from that point to the home. This interface is referred to as the Optical Hub and can take various deployment structures depending on the specific requirements of the system. The RFoG system ends at the subscriber side interface of an RFoG Optical Network Unit (R-ONU) at the home. Passive: 32 split over 20 km following the industry standard for PON; no active devices in the plant. Hybrid: active field optics (EDFA, return Rx/Tx) are utilized either to conserve or extend the reach of the fiber. Customers located outside the 20 km distance can also be reached by decreasing the split ratio (up to 48 km). Alternatively, if the distance is lower, the split ratio can be increased. Despite its numerous advantages, the wide deployment of RFoG has been consistently delayed so far due to the Optical Beat Interference (OBI), a deleterious effect that influences both the upstream and the downstream throughputs. Even small amounts of OBI are detrimental to the optimal utilization of RFoG networks. A statistical probability event by nature, OBI occurs when two transmitters located on the same or a similar optical wavelength transmit simultaneously to the same optical receiver. The severity of OBI increases along with the number of active customers, the number of upstreams used and the amount of data transmitted. 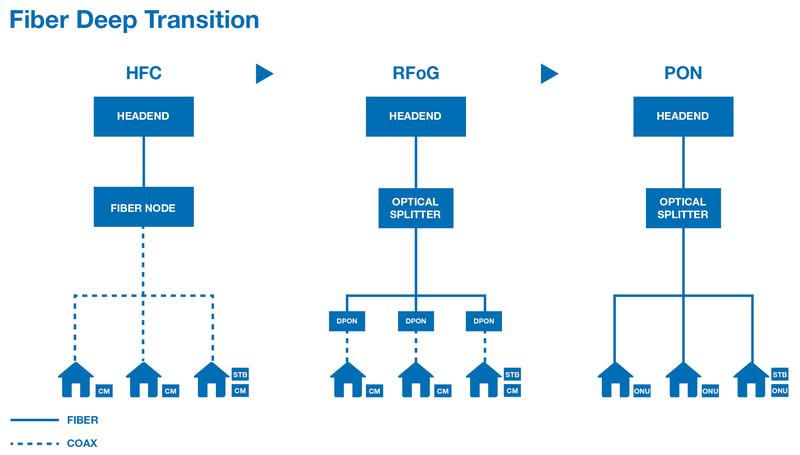 Fortunately, recent technological advances led to the creation of OBI-free systems that eliminate the risk of two transmitters operating simultaneously at the same wavelength, which sets the stage for the large scale rollout of RFoG. However, RFoG is criticized for its high cost of scaling when compared to Ethernet Passive Optical Networks (xPON). A Total Cost of Ownership (TCO) analysis performed by Bell Labs revealed that xPON’s TCO starts to trend lower from year three, while by year five the indicator is 37% to 52% lower than the one of RFoG. One of the main reasons for this discrepancy is given by the fact that RFoG uses DOCSIS for IP services, which costs more per bit compared to PON. With downstream traffic consumption expected to boom in the next years, RFoG is also forecast to carry a higher CAPEX over time. This financial aspect could once again limit the large scale deployment of RFoG.